I love Christmas. I love the colors and lights, the decorations and songs, the TV specials and the Christmas parties. Here in China, I love the questions people ask at this time of year. The story of Christmas is new to so many, and when I explain things it makes the story new to me all over again! I had a class once that made Christmas feel “new.” “The Life of Christ” was taught by an old seminary professor, and Dr. Hulbert had taught the Bible so long, knew the original languages so well, and had led so many groups to Israel that—well, when he talked about Jesus’ life you would have believed that he had been there himself! I believe he is retired now, but you can still have some fun at his website: http://ancientsandals.com/. Now, I will warn you that Dr. Hulbert is a real purist. He believes that what the Bible says is history and fact; and he showed us many things that we thought were in the Bible but were not really there! You may discover a few of those today, and I challenge you to look into these things yourself. Don’t just take my word for it! This church is an interesting mix of people. We have old Christians who know the Bible well, new Christians who do not, and a number of additional people who are still on their search for the Truth. Because of that mix, I thought it might be interesting today to quickly go through the Christmas story in chronological order. 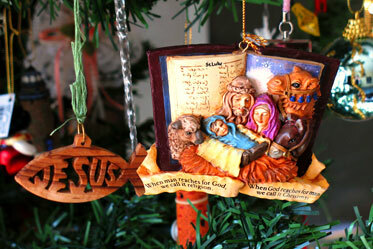 Of course, the Christmas story is really several different stories, often grouped together. Unfortunately, because they are so frequently grouped together, many think several parts happened at the same time or in the wrong order. What stories am I talking about? They include the birth of John the Baptist, the angel’s announcements to both Mary and Joseph, events in Bethlehem, Simeon and Anna in the temple, the visit of the Magi, King Herod’s rage, and more. But let’s start at the beginning. The Old Testament ends 400 years before the birth of Jesus with these words about the forerunner to the promised Messiah: “He will turn the hearts of the fathers to their children, and the hearts of the children to their fathers…” (Malachi 4:5-6). As if God were just releasing the pause button on a CD player, the New Testament story begins with the angel Gabriel bringing Zechariah the same words: “he will go on before the Lord… to turn the hearts of the fathers to their children and the disobedient to the wisdom of the righteous…” (Luke 1:17). The angel was talking about a son Zechariah and Elizabeth were about to have, even though they are well advanced in years—a son named John the Baptist. About six months later, the angel Gabriel appears to Mary, announcing that she would become the mother of the Messiah (Israel’s Deliverer and Savior; Luke 1: 26-56). Mary graciously received this wonderful news, along with the news that her supposedly “barren” relative Elizabeth was now six-months pregnant. The Bible says Mary “hurried” to a town in the hills outside Jerusalem to be with Elizabeth until just before John was born. It was a logical thing to do: Zechariah was a priest so maybe he could help her process this incredible news, and since the angel had mentioned it, maybe that was a sign that Mary needed to be there to help. Besides, the hill country would be a good place to go to get away from her fiancé while Mary’s tummy started to grow! We don’t know if she told Joseph before she left—but Matthew’s text makes it seem unlikely. Mary was three-months pregnant when she got home to Nazareth, there she “was found to be with child” (Matt 1:18), and so Joseph decides to break off the engagement. Interestingly, God lets him “consider” this for a while before bringing Gabriel back, this time appearing in Joseph’s dream. Joseph immediately believes and obeys the word from Heaven, and takes Mary to be his wife. Sometime in the next few months Caesar Augustus called for a census, for which everyone had to go back to the land of his ancestors. Thus, Joseph had to head 85 miles south (140 KM) to Bethlehem, and Mary went with him. We don’t know how long they were in Bethlehem before the baby was born, but the Bible says “while they were there” the time came, Mary gave birth, and laid Jesus in a manger (Luke 2:6-7). What’s that? You thought Mary arrived late at night, deep in labor pains, was turned away by a mean old innkeeper and had to go to a stable? Maybe. It makes for a dramatic story. But that stuff is not really in the Bible. Check it out yourself! However, the Bible does indicate that Jesus was born in the evening, and nearby shepherds got a visit from a multitude of heavenly hosts (i.e. angels) who praised God and told the shepherds that a Savior had been born. The angels said this special baby was currently lying in a manger, so the shepherds decided to check it out (and who wouldn’t!). They found the baby, and then started telling people about their “close encounter” with angels on the hillside. Eight days later (Luke 2:21), Jesus was circumcised (likely in Bethlehem). Then on the 40th day after the birth, they headed for Jerusalem to dedicate the baby in the Temple and offer a required sacrifice (Luke 2:22). Here they met Simeon, a Spirit-filled man (possibly advanced in years) who was looking for the Promised Messiah because God had told him he would not die until they had met face to face. This is another great Christmas mini-story (Luke 2:25ff). When Mary and Jesus got to the temple, the Holy Spirit spoke to Simeon and revealed that this was the face of God’s promise! Then an 84-year-old prophetess named Anna got a similar revelation, and began to speak of Jesus to those who were looking for God’s redemption. After this, Joseph, Mary and Jesus moved back to Nazareth (Luke 2:39). We are not sure how long they stayed there, but by Matthew 2:1 they are again living in Bethlehem. Many scholars believe they simply went to Nazareth to collect Joseph’s tools and a few other things, and then they moved to Bethlehem. There are plenty of reasons for this supposition. Think about it. Angels have spoken to you (or people you know) four times (this was as uncommon then as it is now!). Two people in God’s Temple have also confirmed that your son is the Messiah. We know from Mary’s song in Luke 1:46 that she knew the Scriptures well (it contains 15 quotes from the Old Testament). Joseph was probably just as dedicated to the Word of God. They knew Jesus was the Son of David, so it made sense to raise Him in the “City of David”—Bethlehem. They had relatives in Bethlehem. They had already lived in Bethlehem 2 to 4 months waiting on the baby and then waiting on the dedication, so Joseph had time to develop contacts and start to establish a reputation as a carpenter. Who knows, I wouldn’t put it past God to arrange things so that Bethlehem needed a good carpenter at just this time! Finally, more evidence that they had moved to Bethlehem is found in Matt 2:21, as Joseph had originally planned to return to Bethlehem, not Nazareth, after the flight to Egypt. But I’m getting ahead of myself. We are in Matthew chapter two, and now we come to another great mini-story: the account of the Wise Men. These guys are called Wise Men, Magi and even “Kings.” We really don’t know much about them, except that they came from the East. We don’t know how many there were (“three” according to tradition, but the Bible doesn’t say). They were likely astronomers or astrologers who counseled eastern leaders based on their interpretations of the movements of the stars. What did they see that sent them to Israel looking for a new king? We are not sure, but modern astronomers have learned that something very unusual occurred in space at about the time Jesus was born. There was an extremely rare conjunction of three planets—that is, it looked like three planets were in the same place in the night sky. Due to the limitations of First Century astronomy, it might have looked like a “new star.” This conjunction took place in a constellation that was often associated with Israel in ancient times. This would have been like a billboard or Heavenly Proclamation to people trained in such things: “NEW KING BORN IN ISRAEL!” So, they went to the capital of Israel (a logical place to look for a king), and that is where Matthew 2:1 picks up the story. When Israel’s King Herod heard what the Magi were looking for, he was “troubled, and all Jerusalem with him”(2:3). Historians tell us that “all Jerusalem” had reason to be afraid. Herod was both a great leader and an extremely evil man! He had killed most of his own family in fear that they would take his place, so the Magi’s quest probably made him very angry. His priests sent the visitors to Bethlehem (where Scripture foretold Messiah’s birth). Herod then lied to the Wise Men and asked them to return if they found anything in Bethlehem so that “I too may come and worship him.” This was really the last thing in his mind. In Matt 2:9ff we read of another mysterious star. While there was a conjunction of two planets about two years after the conjunction of three planets, I think they may have seen some kind of local, supernatural phenomenon, because this new star somehow “stood over where the Child was” (2:9). So, did the shepherds and Wise Men rub elbows in a stable, standing in the glow of a bright star on the night Jesus was born? Sorry. That is not what the Bible says. According to Matt 2:11, the Magi found Mary and Jesus in a “house” not a stable. This is another proof that the family had moved back to Bethlehem—they now had a house! The Bible also says the Wise Men saw a “Child,” not an infant—and yes, the Greek word indicates a toddler, not a baby. The Magi had not been on a casual holiday. They may have searched for this Child for up to two years, and thus it is no wonder that they “rejoiced exceedingly with great joy” when they finally looked into the Messiah’s face. On bended knee they offered their gifts, which providentially would have come in very handy to finance the family’s flight to Egypt—which finally brings us to the end of the Christmas story. So, there you have it. The Christmas Story in chronological order. It spans about three years, and takes place in Nazareth, Bethlehem, Jerusalem, the Hills of Judea, Rome, Egypt, and some unknown country or countries in the East. To me, the Wise Men and King Herod typify humanity’s experience with Christmas. Herod knew from Scripture about the Messiah, but he acted in fear and self-interest. He refused to believe and thereby forfeited the chance to see the Messiah in person. He then compounded his disgrace and eternal debt by killing all of the babies in Bethlehem under age two. King Herod is the ultimate example of someone who “missed” Christmas. On the other hand, the Wise Men believed the sign they got from Heaven—even though they were not even Jewish! They made a long search for the Child, and when they found Him they worshiped him and were filled with incredible joy. I can’t believe their lives were ever the same again. These men are the ultimate example of people who “find” Christmas. The choice is ever before each of us. The path of doubt leads only to death. In Herod’s case it was both the death of innocent children, and his own death a year or two later. The path of faith will be much harder. Mary risked losing her reputation and fiancée when she said yes to God. Joseph had to struggle with his choice. Shepherds had to leave their flocks and search door to door to find Jesus. Simeon and Anna had to wait—maybe for years—before they “found Christmas.” Finally, the Wise Men may have searched for two years before meeting Jesus face to face. The Christmas story for each of these people has three things in common—and if we are to really “find Christmas” we need the same three things. 1) A Word from Heaven was essential in pointing them to the Christ Child. 2) They had to overcome some difficulty—or one might say they had to search with all their heart. 3) They looked into the Face of God the Son. To see God’s Promise, before he passed away. And many died, as did a king who chose to turn from Grace. Or bring the Peace he could have found, if he’d looked on Jesus face. Notice that the shepherds were led by angels. There is no record of them “seeing the star” of the Wise Men—see below. Perhaps this is why God chose Mary—she was extraordinary in a time when Rabbi’s were forbidden to teach the Bible to females. Probably around 30-40 children within Bethlehem’s population of around 1000. One more note (added in 2009): Page 313 of Faith of Our Fathers by Chan Kei Thong shows Chinese court records from around 5 B.C. during the Han dynasty telling of a comet that was visible for 70 days; the time given coincides with the best modern estimates of the time of Jesus' birth. The first century Chinese astronomers added: "The appearance of this comet undoubtedly symbolizes change. The extended appearance of this comet indicates that this is of great importance." Perhaps this is what the "wise men" saw--surely, the "star" was visible all over the planet. Interestingly, the Chinese records also note a second comet about 13 months later; perhaps this is the second "mysterious star." Furthermore, a 2003 book says that Liu Shang, chief astrologer of the Han court at the time of Christ's birth--disappeared for two years after discovering a new star called the "king star." (p5, PHattaway) Could this Chinese scientist have been one of the "Wise Men from the East"? © 2001 Michael Krigline, all rights reserved. As far as I am concerned, people are allowed to print/copy it for personal or classroom use.